"At So go Solar we have for years used the HookStop product along with Redtip hooks as our default product on plain tiles roofs. They are easy to use and significantly reduce tle damage both during installation and afterwards, giving peace of mind to both our customers and ourselves. We highly recommend the product." Ian Jepson Director of RENEW EARTH Ltd.
"I have used Hookstops with Redtip roof anchors on many plain tile PV roof installations. As far as I know they are the best solution available for plain tiles on the market. They prevent tile breakage, are very easy to fit and are made from recycled materials. They were especially valuable on a recent installation I did at Turners Hill School working with JOJU Solar and REPOWERBalcombe." Paul visited the HookStop display at Solar Energy UK Exhibition 2015, he had this to say about HookStop. "We were initially sceptical about adding another component part into our roof mounting system as, like all installers our margins have been shrinking. However, utilising the HookStop on two jobs recently, we are now sold on the product. The product eliminates the problem on Rosemary tiled roofs of installers standing on the mounting rail and the downward flexing of the roof hook, cracking the roof tile. 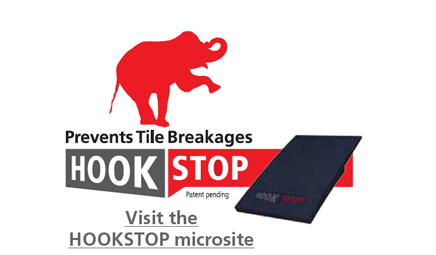 HookStop, prevents this by absorbing the roof hook flexing; it significantly speeds up installation time and the cost is largely offset because there is no lead work needed. The benefits are also used in our initial site survey to the customer. 10 out of 10 ! !....a product that really works and saves time." "Using Hookstop - we didn't crack one tile!, it isn't cheap but a 1 and a half day install becomes a 1 day install, the cost works out about the same but less time on the roof, Hookstop also seals the entry - we were using lead but it's expensive and doesn't quite seal the entry to small insects"